SwiftKey is trying to make a leap in text input prediction and it thinks that using a neural network is the way to make that happen. With that in mind, SwiftKey has announced SwiftKey Neural Alpha, which it claims to be the first neural network-powered keyboard, and in the little bit that we've used it, it does seem pretty good. The idea is to use a digital brain to be able to better understand the context of what you're writing, much like Google uses its neural network to understand context of spoken language. To start, SwiftKey says it will make better predictions than other keyboards, and eventually hopes to be able to be able to predict entire messages for you. How has SwiftKey built its neural network? By applying machine learning to everything that any of you have ever typed using a SwiftKey keyboard, of course. The way that SwiftKey makes the claim that this is the first neural network keyboard is because rather than massive servers doing the heavy lifting, SwiftKey says this is "the first time this type of language model technology has been engineered specifically to operate locally on a smartphone keyboard." As noted above, we've been using the keyboard for a few hours and the predictions do seem to be better than before. Presumably, it will only get better from here. 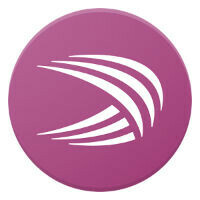 As of right now, SwiftKey Neural Alpha is only available on Android. There's no word on if it will be coming to iOS. I Use Talk To Text 90% Of The Time. Does That Answer Your Question LOL. Thanks PA for posting this info. I LOVE Swifkey and have been using it for a long time. I especially like the fact you can resize the keyboard and "squish" it to the side of the screen closest to your thumb for easier one handed operation. Lazy? Thumb typing on a phone is downright annoying. I was all about Swiftkey until I realized swiping on Google's stock keyboard was more accurate. I haven't used my thumbs to touch type on a phone in years.